Check out Charlotte‘s WWE profile here! Ashley Fliehr was born in Charlotte, North Carolina and raised by parents, WWE Hall of Fame member Ric Flair and Elizabeth Fliehr. On May 17, 2012, Ashley Fliehr signed a developmental contract with WWE and was assigned to its developmental territory NXT Wrestling. On August 11, 2012, Ashley Fliehr was given the name Charlotte. October 25, 2012 – NXT Live Event: Dani defeated Charlotte, Audrey Marie, Anya, Emma, Sasha Banks, Paige and Summer Rae in a halloween costume battle royal. November 29, 2012 – NXT Live Event: Emma defeated Charlotte. December 13, 2012 – NXT Live Event: Charlotte and Sasha Banks defeated Anya and Paige. December 20, 2012 – NXT Live Event: Charlotte defeated Dani, Anya, Sasha Banks and Paige in a battle royal. January 3, 2013 – NXT Live Event: Anya and Yoshi Tatsu defeated Charlotte and Angelo Dawkins. January 24, 2013 – NXT Live Event: Charlotte, Luchadora (Bayley) and Paige defeated Audrey Marie, Paige and Summer Rae. January 31, 2013 – NXT: Charlotte defeated Natalya in a dark match. February 7, 2013 – NXT Live Event: Audrey Marie and Emma defeated Sasha Banks and Charlotte. February 13, 2013 – NXT Live Event: Audrey Marie and Emma defeated Sasha Banks and Charlotte. February 24, 2013 – NXT Live Event: Summer Rae and Charlotte (w Ric Flair) defeated Sasha Banks and Paige. March 27, 2013 – NXT Live Event: Audrey Marie and Emma defeated Charlotte and Sasha Banks. March 28, 2013 – NXT Live Event: Charlotte and Percy Watson defeated Audrey Marie and Sakamoto. April 10, 2013 – NXT Live Event: Bayley defeated Charlotte. April 17, 2013 – NXT Live Event: Sasha Banks defeated Charlotte. April 18, 2013 – NXT Live Event: Charlotte and Emma defeated Sasha Banks and Paige. April 24-25, 2013 – NXT Live Event: Charlotte and Emma defeated Naomi and Sasha Banks. May 25, 2013 – NXT Live Event: Kendall Skye, Paige and Sasha Banks defeated Charlotte, Emma and Bayley. May 30, 2013 – NXT Live Event: Bayley and Emma defeated Charlotte and Sasha Banks. June 6, 2013 – NXT Live Event: Bayley and Emma defeated Charlotte and Kendall Skye. June 13, 2013 – NXT Live Event: Charlotte and Emma defeated Summer Rae and Bayley. July 17-18, 2013 – NXT: Kendall Skye, Paige and Sasha Banks defeated Bayley, Charlotte and Emma. July 18, 2013 – NXT: Charlotte (Debut) (w Ric Flair) defeated Bayley. July 19, 2013 – NXT: Kendall Skye, Paige and Sasha Banks defeated Bayley, Charlotte and Emma. July 25, 2013 – NXT Live Event: Paige defeated Charlotte. August 1, 2013 – NXT Live Event: Charlotte, Emma and Kendall Skye defeated Bayley, Paige and Sasha Banks. October 10, 2013 – NXT: Charlotte w Bayley defeated Santana Garrett. after the match Sasha Banks and Summer Rae attacked Bayley and Charlotte until Emma made the save. January 30, 2014 – NXT: Bayley defeated Sasha Banks w Summer Rae and Charlotte. March 13, 2014 – NXT: NXT women’s champion Paige defeated Sasha Banks w Charlotte in a non-title match. March 21, 2014 – NXT Live Event: Paige, Emma and Bayley defeateded Charlotte, Sasha Banks and Alexa Bliss. April 6, 2014 – WrestleMania 30: Charlotte was with Alexa Bliss and Sasha Banks as one of Triple’s entrance girls. April 24, 2014 – NXT: Charlotte and Sasha Banks defeated Emma and Paige. May 8, 2014 – NXT: Charlotte w/Sasha Banks defeated Emma in the quarter-finals of the NXT women’s title tournament. May 15, 2014 – NXT: Charlotte w/Sasha Banks defeated Alexa Bliss in the semi-finals of the NXT women’s title tournament. May 29, 2014 – NXT Takeover: Charlotte defeated Natalya to win the vacant WWE NXT women’s championship. June 5, 2014 – NXT: NXT women’s champion Charlotte defeated Bayley in a non-title. June 24, 2014 – NXT: Bayley, Emma and Paige defeated Charlotte, Sasha Banks and Summer Rae. June 26-27, 2014 – NXT Live Event: NXT women’s champion Charlotte defeated Bayley to retain the title. July 12-13, 2014 – WWE Live Event: Nikki Bella and Natalya defeated Charlotte and Sasha Banks. July 24, 2014 – NXT: NXT women’s champion Charlotte defeated Summer Rae to retain the title. July 31, 2014 – NXT: NXT women’s champion Charlotte defeated Becky Lynch to retain the title. August 1-2, 2014 – NXT Live Event: NXT women’s champion Charlotte defeated Bayley to retain the title. August 7, 9,2014 – NXT Live Event: NXT women’s champion Charlotte defeated Bayley to retain the title. August 21,23 2014 – Live Event: Bayley defeated Charlotte in a non-title match. August 29-30, 2014 – Live Event: Bayley defeated Charlotte in a non-title match. September 5-6, 2014 – Live Event: Bayley defeated Charlotte in a non-title match. September 13, 2014 – Live Event: Bayley defeated women’s champion Charlotte in a non-title match. September 18, 2014 – NXT: NXT women’s champion Charlotte defeated Emma in a non-title match. September 18,20 2014- Live Event: NXT women’s champion Charlotte defeated Becky Lynch in a non-title match. October 2, 2014 – NXT: NXT women’s champion Charlotte defeated Bayley to retain the title. October 9, 2014 – Live Event: Charlotte, Alexa Bliss and Bayley defeated Becky Lynch, Carmella and Dana Brooke. October 10-11, 2014 – Live Event: Becky Lynch, Carmella and Dana Brooke defeated Alexa Bliss, Bayley and Charlotte. October 16, 2014 – NXT: NXT women’s champion Charlotte defeated Becky Lynch in a non-title match. October 24, 2014 – Live Event: Charlotte, Bayley and Devin Taylor defeated Becky Lynch, Sasha Banks and Dana Brooke. November 1, 2014 – Live Event: NXT women’s champion Charlotte defeated Sasha Banks in a non-title match. November 6,8, 2014 – Live Event: Sasha Banks defeated Charlotte in a non-title match. November 20-21, 2014 – Live Event: Sasha Banks defeated Charlotte in a non-title match. December 4, 2014 – NXT: NXT women’s champion Charlotte defeated Mia Yim in a non-title match. February 27-28, 2015 – NXT Live Event: Charlotte defeated Becky Lynch. March 5, 2015 – NXT Live Event: Charlotte defeated Bayley. April 22, 2015 – NXT: Becky Lynch defeated Charlotte and Bayley in a 3-way to become #1 contender for the women’s title. May 6, 2015 – NXT: Charlotte defeated Emma. June 17, 2015 – NXT: Charlotte defeated Cassie. June 26, 2015 – NXT Live Event: Charlotte and Devin Taylor defeated Lina and Cassie. July 29, 2015 – NXT: Charlotte defeated Dana Brooke. July 30, 2015 – NXT Live Event: Charlotte and Bayley defeated Dana Brooke and Emma. July 31, 2015 – NXT Live Event: Charlotte and Bayley defeated Jessie McKay and Lina. December 7, 2014 – WWE Live Event: Charlotte, Emma and Alicia Fox defeated The Bella Twins and AJ Lee. March 7, 2015 – WWE Experience Tag 1: NXT women’s champion Sasha Banks defeated Charlotte in a non-title match. Charlotte defeated Carmella. May 1-3, 2015 – Live Event: Charlotte defeated Naomi. May 7, 2015 – SmackDown: Natalya defeated Charlotte in a dark match. May 9-10, 2015 – Live Event: Charlotte, Emma and Natalya defeated Cameron, Summer Rae and Alicia Fox. May 14, 2015 – SmackDown: Charlotte defeated Emma in a dark match. May 23-24, 2015 – WWE Live Event: Charlotte and Emma defeated Alicia Fox and Layla El. August 8-9, 2015 – Live Event: PCB (Becky Lynch, Charlotte and Paige) defeated Team B.A.D. (Naomi, WWE NXT champion Sasha Banks and Tamina). August 15, 2015 – Live Event: PCB (Charlotte and Paige) defeated Team Bella (Alicia Fox and Brie Bella). August 16, 2015 – Live Event: PCB (Becky Lynch and Charlotte) defeated Team Bella (Alicia Fox and Brie Bella). August 6, 2015 – SmackDown: Charlotte fought Naomi to a no contest. August 6, 2015 – SmackDown: WWE NXT champion Sasha Banks and Naomi defeated Charlotte and Becky Lynch. August 13, 2015 – SmackDown: Charlotte defeated Naomi. August 23, 2015 – SummerSlam: Team PCB (Paige, Charlotte, and Becky Lynch) defeated Team Bella (WWE Divas champion Nikki, Brie, and Alicia Fox) and Team B.A.D. (Tamina, Naomi, and Sasha Banks) in a 3-team Divas elimination match. September 3 2015 – SmackDown: Charlotte defeated Tamina. September 20, 2015 – Night of Champions: Charlotte defeated WWE Divas champion Nikki Bella to win the title. ~~~Paige turned on her team after this match. October 31, 2015 – Main Event: Brie Bella (w/Alicia Fox & Nikki Bella) defeated Becky Lynch (w/Charlotte). November 5-6, 2015 – Live Event: WWE Divas champion Charlotte defeated Paige to retain the title. November 10-14, 2015 – Live Event: WWE Divas champion Charlotte defeated Alicia Fox and Paige in a 3-way match to retain the title. November 22, 2015 – Survivor Series: WWE Divas champion Charlotte defeated Paige to retain the title. November 23, 2015 – RAW: WWE Divas champion Charlotte fought Paige to a double count-out. Charlotte retains the title. November 28, 2015 – Main Event: Brie Bella defeated WWE Divas champion Charlotte in a non-title match. November 30, 2015 – RAW: WWE Divas champion Charlotte defeated Becky Lynch in a non-title match. December 4-6, 2015 – Live Event: WWE Divas champion Charlotte defeated Paige to retain the title. December 13, 2015 – TLC: WWE Divas champion Charlotte defeated Paige to retain the title. December 26-27, 2015 – Live Event: WWE Divas champion Charlotte defeated Becky Lynch and Paige in a 3-way match to retain the title. December 28, 2015 – Live Event: WWE Divas champion Charlotte defeated Paige to retain the title. December 29, 2015 – Live Event: WWE Divas champion Charlotte defeated Becky Lynch and Paige in a 3-way match to retain the title. December 30, 2015 – Live Event: WWE Divas champion Charlotte defeated Becky Lynch to retain the title. January 4, 2016 – RAW: Becky Lynch defeated WWE Divas champion Charlotte in a non-title match. January 7, 2016 – SmackDown: WWE Divas champion Charlotte defeated Becky Lynch to retain the title. January 9-10, 2016 – Live Event: WWE Divas champion Charlotte defeated Becky Lynch to retain the title. January 15-16, 2016 – Live Event: WWE Divas champion Charlotte defeated Summer Rae to retain the title. January 24, 2016 – Royal Rumble: WWE Divas champion Charlotte defeated Becky Lynch to retain the title. January 30-31, 2016 – Live Event: WWE Divas champion Charlotte defeated Becky Lynch and Paige in a 3-way match to retain the title. February 6-7, 2016 – Live Event: WWE Divas champion Charlotte defeated Becky Lynch to retain the title. February 10-13, 2016 – Live Event: WWE Divas champion Charlotte defeated Paige to retain the title. February 27-28, 2016 – Live Event: WWE Divas champion Charlotte defeated Becky Lynch to retain the title. March 5-6, 2016 – Live Event: WWE Divas champion Charlotte defeated Becky Lynch to retain the title. March 28, 2016 – RAW: WWE Divas champion Charlotte defeated Becky Lynch in a non-title match. April 13-17, 2016 – Live Event: WWE women’s champion Charlotte defeated Becky Lynch and Sasha Banks in a 3-way match to retain the title. April 20-23, 2016 – Live Event: WWE Women’s champion Charlotte defeated Becky Lynch and Sasha Banks in a 3-way match to retain the title. May 5, 2016 – SmackDown: Natalya & Becky Lynch defeated WWE Women’s Champion Charlotte & Emma. May 6-8, 2016 – Live Event: WWE women’s champion Charlotte defeated Natalya to retain the title. May 9, 2016 – RAW: Paige defeated WWE women’s champion Charlotte in a non-title match. May 16, 2016 – RAW: Shane McMahon told Ric Flair he was banned from the WWE women’s title match at Extreme Rules. May 20, 2016 – Live Event: WWE women’s champion Charlotte defeated Becky Lynch to retain the title. May 22, 2016 – Extreme Rules: WWE women’s champion Charlotte defeated Natalya to retain the title. Ric Flair was banned from ringside. May 23, 2016 – RAW: Charlotte said to Ric Flair she does not need Ric Flair anymore to be on her side. June 26, 2016 – Live Event: Becky Lynch & Paige defeated Charlotte & Lana. June 29, 2016 – Live Event: WWE women’s champion Charlotte defeated Becky Lynch to retain the title. July 1, 2016 – Live Event: WWE women’s champion Charlotte defeated Becky Lynch to retain the title. July 19, 2016 – SmackDown Live: Dana Brooke and Charlotte defeated Sasha Banks in a handicap match. Charlotte gets drafted by Stephanie McMahon & Mick Foley to join Monday Night Raw at #3. August 10-13, 2016 – Live Event: WWE women’s champion Sasha Banks defeated Charlotte to retain the title. September 7-10, 2016 – Live Event: Charlotte defeated Sasha Banks to retain the women’s title. February 13, 2017 – RAW: Bayley defeated Charlotte to win the RAW women’s title. March 13, 2017 – RAW: Sasha Banks defeated Dana Brooke. After the match Dana turned baby face and attacked Charlotte. April 11, 2017 – SmackDown Live: Charlotte Flair became a member of the SmackDown Live brand via the Superstars Shakeup. April 18, 2017 – SmackDown Live: Charlotte Flair defeated WWE SmackDown Live women’s champion Naomi in a non-title match to become #1 contender for the women’s title. April 25, 2017 – SmackDown Live: Charlotte Flair vs. Naomi ended in a no contest. Naomi retains the SmackDown Live women’s title. July 4, 2017 – SmackDown Live: Charlotte Flair defeated Natalya in a dark match. July 18, 2017 – SmackDown Live: Becky Lynch defeated Charlotte Flair. July 23, 2017 – Battleground: Natalya defeats Becky Lynch and Charlotte Flair and Lana and Tamina in a 5-way elimination match to become #1 contender for the SmackDown Live women’s title. July 25, 2017 – SmackDown Live: Charlotte Flair and Becky Lynch defeated Lana and Tamina. August 6-7, 2017 – Live EVent: Natalya defeated Charlotte Flair. August 8, 2017 – SmackDown Live: Charlotte Flair defeated Lana. August 26-28, 2017 – Live Event: Charlotte Flair and Becky Lynch defeated Lana and Tamina. August 29, 2017 – 205 Live: WWE SmackDown Live women’s champion Natalya defeated Charlotte Flair to retain the title in a dark match. September 2-4, 2017 – Live Event: Charlotte Flair and Naomi defeated Natalya and Tamina. September 13, 16-17, 2017 – Live Event: Becky Lynch, Charlotte Flair and Naomi defeated Carmella, Lana, Natalya and Tamina in a handicap match. September 19, 2017 – SmackDown Live: Charlotte Flair defeated Becky Lynch, Naomi and Tamina in a 4-way match to become #1 contender for the SmackDown Live women’s title. October 8, 2017 – Hell In A Cell: Charlotte Flair defeated Natalya by disqualification. Natalya retains the SmackDown Live women’s title. October 23, 2017 – RAW: Charlotte Flair showed up with the rest of the SmackDown Live roster and attacked the RAW roster. November 19, 2017 – Survivor Series: SmackDown Live women’s champion Charlotte Flair defeated WWE RAW women’s champion Alexa Bliss in a non-title match. December 5, 2017 – SmackDown Live: WWE SmackDown Live women’s champion Charlotte Flair defeated Tamina w Lana in a non-title match. December 17, 2017 – Clash Of The Champions: Charlotte Flair defeated Natalya in a lumberjill match to retain the women’s title. January 2, 2018 – SmackDown Live: Becky Lynch, Naomi and Charlotte Flair and went for their revenge on the Riott Squad. January 9, 2018 – SmackDown Live: Becky Lynch w Naomi & Charlotte Flair defeated Ruby Riott w The Riott Squad. January 28, 2018 – Royal Rumble: Charlotte Flair watched the Royal Rumble match at ringside as the current champion. February 6, 2018 – SmackDown Live: WWE SmackDown Live women’s champion Charlotte Flair defeated Sarah Logan w The Riott Squad in a non-title match. March 17-18, 2018 – Live Event: Becky Lynch, Charlotte Flair and Naomi defeated The Riott Squad (Liv Morgan, Ruby Riott and Sarah Logan). April 3, 2018 – SmackDown Live: SmackDown Live women’s champion Charlotte Flair defeated Natalya in a non-title match. April 8, 2018 – WrestleMania 34: Charlotte Flair defeated Asuka to retain the women’s title. April 10, 2018 – SmackDown Live: Carmella cashed in her money in the bank contract and defeated Charlotte Flair to win the women’s title. May 6-7, 2018 – Live Event: Carmella defeated Charlotte Flair to retain the women’s title. June 2-3, 2018 – Live Event: Carmella defeated Charlotte Flair to retain the women’s title. June 5, 2018 – SmackDown Live: Becky Lynch defeated Charlotte Flair. June 9-10, 2018 – Live Event: Carmella defeated Charlotte Flair to retain the women’s title. June 17, 2018 – Money In The Bank: Alexa Bliss defeated Becky Lynch and Charlotte Flair and Ember Moon and Lana and Naomi and Natalya and Sasha Banks in a ladder match to win the Money In The Bank. July 31, 2018 – SmackDown Live: Charlotte Flair defeated WWE SmackDown Live women’s champion Carmella in a non-title match to become #1 contender for the women’s title. August 6, 2018 – Live Event: Becky Lynch and Charlotte Flair defeated Mandy Rose and Sonya Deville. August 19, 2018 – SummerSlam: Charlotte Flair defeated Becky Lynch and Carmella in a 3-way match to win the SmackDown Live women’s title. August 21, 2018 – SmackDown Live: Becky Lynch explains why she attacked Charlotte Flair at SummerSlam. August 28, 2018 – SmackDown Live: Becky Lynch attacked Charlotte Flair once again. September 1-3, 2018 – Live Event: Asuka and Charlotte Flair defeated Becky Lynch and Carmella. September 4, 2018 – 205 Live: Charlotte Flair defeated Becky Lynch and Carmella in a 3-way, dark match to retain the WWE SmackDown Live women’s title. September 11, 2018 – Live Event: WWE SmackDown Live women’s champion Charlotte Flair defeated Sonya Deville w Mandy Rose in a non-title match. September 16, 2018 – Hell In A Cell: Becky Lynch defeated Charlotte Flair to win the WWE SmackDown Live women’s title. September 17, 2018 – Live Event: Becky Lynch defeated Carmella and Charlotte Flair in a 3-way match to retain the WWE SmackDown Live women’s title. September 18, 2018 – SmackDown Live: Becky Lynch basks in her Championship Coronation, which turned into Becky Lynch & Charlotte Flair brawling all around the ring into the titantron area. September 18, 2018 – Mixed Match Challenge: AJ Styles and Charlotte Flair defeated Jimmy Uso and Naomi. September 22-23, 2018 – Live Event: Becky Lynch defeated Charlotte Flair to retain the WWE SmackDown Live women’s title. September 25, 2018 – SmackDown Live: Becky Lynch attacked Charlotte Flair during her photo shoot. WWE SmackDown Live women’s champion Becky Lynch defeated Lana in a non-title match. October 6, 2018 – Super Show-down: Charlotte Flair defeated Becky Lynch by disqualification to retain the women’s title. October 9, 2018 – SmackDown Live: Becky Lynch vs. Charlotte Flair ended in a double count-out. Becky Lynch retains the WWE SmackDown Live women’s title. October 16, 2018 – SmackDown Live (Episode 1000): Becky Lynch defeated Charlotte Flair in a dark match to retain the WWE SmackDown Live women’s title. October 23, 2018 – SmackDown Live: They shown a pre-taped segment with a brawl at the WWE Performance Center between Charlotte Flair & Becky Lynch. October 28, 2018 – Evolution: Becky Lynch defeated Charlotte Flair in a last woman standing match to retain the WWE SmackDown Live women’s title. November 3-5, 8-9, 2018 – Live Event: Becky Lynch defeated Charlotte Flair to retain the WWE SmackDown Live women’s title. November 13, 2018 – SmackDown Live: Becky Lynch made Charlotte Flair her replacement for her match at Survivor Series. November 20, 2018 – SmackDown Live: Paige fined Charlotte Flair 100,000$ for attacking the 5 referees at Survivor Series. Charlotte Flair defeated Billie Kay w Peyton Royce. Charlotte Flair defeated Peyton Royce w Billie Kay by disqualification. November 27, 2018 – SmackDown Live: Charlotte Flair & Becky Lynch talked about their upcoming match at WWE TLC. December 20, 2018 – Tribute To The Troops: Charlotte Flair & Becky Lynch were special guests on The Miz TV. Becky Lynch and Charlotte Flair defeated Mandy Rose and Sonya Deville. January 8, 2019 – SmackDown Live: Becky Lynch defeated Carmella and Charlotte Flair in a 3-way match to become #1 contender for the WWE SmackDown Live women’s title. January 22, 2019 – SmackDown Live: Charlotte Flair gave a warning to Carmella. January 27, 2019 – Royal Rumble: Charlotte Flair entered the Royal Rumble match at #13 but was won by Becky Lynch. January 29, 2019 – SmackDown Live: Charlotte Flair attacks Becky Lynch. Asuka defeated Charlotte Flair in a dark match to retain the SmackDown Live women’s title. February 26, 2019 – SmackDown Live: Charlotte Flair expects to be crowned the WWE RAW women’s champion at WrestleMania 35. Asuka defeated Charlotte Flair in a dark match to retain the SmackDown Live women’s title. March 5, 2019 – SmackDown Live: Becky Lynch fends off Charlotte Flair’s assault. March 10, 2019 – Fastlane: Becky Lynch defeated Charlotte Flair to become #1 contender for the WWE RAW women’s title. March 12, 2019 – SmackDown Live: Charlotte Flair plans on breaking Becky Lynch’s dreams for WrestleMania. March 16-18, 2019 – Live Event: Becky Lynch defeated Charlotte Flair. March 19, 2019 – 205 Live: Becky Lynch defeated Charlotte Flair in a dark match. 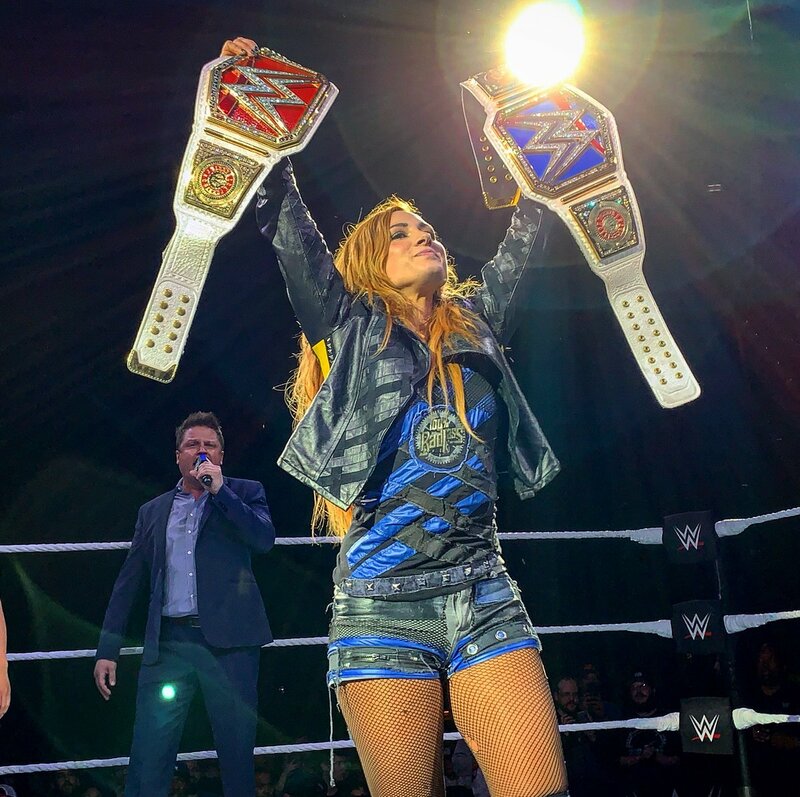 March 24, 2019 – Live Event: Becky Lynch defeated Charlotte Flair. March 25, 2019 – RAW: Charlotte Flair vs. Ruby Riott in a beat the clock challenge ended in a time limit draw. March 26, 2019 – SmackDown Live: Charlotte Flair defeated Asuka to win the WWE SmackDown Live women’s title.